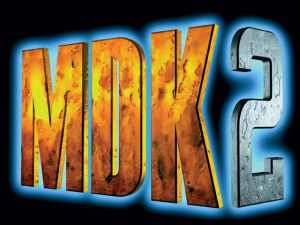 If we had to sum up Interplay's MDK2 in one word, we would choose "old-school." With a silly sense of humour, unforgiving difficulty and enough bullets to take down a small country — or in this case, alien invasion — MDK2 is a "game for gamers" through and through. And while it shows its age a little, it still proves to be one of the strongest titles yet to hit WiiWare. BioWare-developed MDK2 picks up right where Shiny's 1997 original left off with our three protagonists celebrating their victory over an alien invasion of Earth, only to discover a threatening presence that escaped them in Canada. 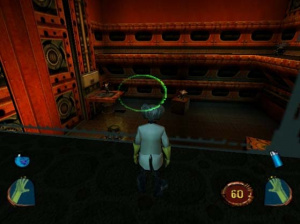 Hero janitor extraordinaire Kurt Hectic, donning the series' signature coil suit, is sent down to take it out. Players step in as Kurt to see what's what and give the aliens what-for, but discovers a larger, rather silly threat and must deal with it. By and large, this is the same game that released as MDK2: Armageddon on PlayStation 2 in 2001. No content has been cut from the main game and the only real compromise comes in the audio and visual departments, where it loses some of its nicer bells and whistles. The sound is noticeably compressed, but that's a necessary sacrifice to squeeze a CD-ROM title into a claustrophobic 40Mb for WiiWare. Thanks to strong art direction the game still looks nice — although characters appear rather blocky for this day and age — but the lack of shadows, which helped smooth over the rough spots in the original release, are missed. The framerate runs at a very smooth clip, too, with no slowdown apparent among the hordes of enemies, explosions and alien worlds. Widescreen support, however, is sadly missing. As it stems from Armageddon, the WiiWare version includes the selectable difficulty levels absent from 2000's Dreamcast and PC release. The choice of difficulty is welcome because, man, this game can be brutal. 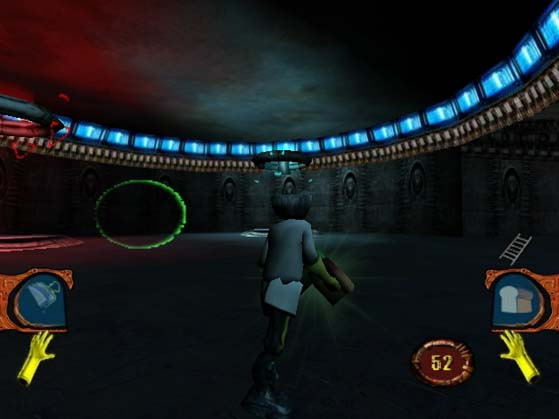 Much of the challenge can be attributed to overwhelming opposition (of which there is plenty) as well as insane level design. Platforming feats expected of you can be downright diabolical at times as you try to leap between impossibly thin girders or across a gap that is inches away from certain doom. Some may find themselves having less fun here as these portions can become quite aggravating, a problem that we didn't feel as strongly during the equally challenging but more entertaining task of battling overwhelming hordes of enemies. Judicious use of quicksave/load helps alleviate some of this frustration. Between miraculous feats of platforming and seemingly endless streams of bad guys in places, death is inescapable, much in the vein of shooters like Contra or Metal Slug. What sets MDK2 apart from these — besides actually being fun in 3D — is variety. Each of the three characters comes with its own abilities and rhythm to mix up the blasting. Kurt's coil suit is equipped with a ribbon parachute for gliding as well as an arm cannon that doubles as a helmet with built-in sniper rifle. Max has six limbs and a jetpack, allowing him to quad-wield weapons and zip about in the air. Dr. Hawkins lacks combat strength but makes up for it in crazy science, creating nuclear toasters and leaf blowers out of materials strewn around the environment. Unfortunately, Hawkins' stages tend to rely on non-combat scenarios and he proves the most frustrating character to play, feeling like a tedious detour from what makes this game enjoyable. It also doesn't take itself in any way seriously. Between the aforementioned toaster gun, cigar-smoking dog, potty humour and an antagonist named Shwang Shwing, the game is heavily marinated in a campy, playful sci-fi vibe sorely missing from a lot of titles nowadays. We were slightly surprised to see just how responsive and quick MDK2's controls are: pointer aiming is a natural fit and feels very smooth and accurate. You can only adjust turn sensitivity, but honestly we'd be surprised if many felt the need to tinker with the default settings at all. MDK2 is at its best when it goes nuts with large, crazy enemies and bullets galore through its strange environments, but not so much when it comes to puzzle-solving or platforming. If you can put up with or simply muscle through these very weak sections then you'll find MDK2 a great blast from the past. Looks good! I might try this one out. i agree with thr review. people shouldn't judge this as a wiiware game, i judge it with the console games and i still give it an 8. the only downside to me so far is the doc's levels., it's not always clear what your supposed to do and his platforming takes a lot of getting used to. "Unforgiving difficulty" and "Game can be brutal"? Sounds like this is a very frustrating game. Any chance of coming over to PAL? I'mma be picking up 2 points cards... my first gaming purchase of the year I think... and I'll be getting this, BIT. TRIP FLUX, FFIV, Chrono Trigger, and likely a NES game I missed out on as a kid (which one, I don't know yet). Gonna be a good summer. This game is difficult? With quicksave you can cheat through this on the highest difficulty. No widescreen... foolish decision. Would gladly pick it up otherwise. Now I'm having second thoughts. I bought this one just out of curiosity, though I've been a fan of MDK since the first one was released, I was expecting this to be an absolute mess due to Wiiware size limitations, but I have to admit I was really surprised! Besides, aiming with the wiimote makes the game much easier. Not so much during Hawkin's levels though, but those are a convoluted mess of platforms and deadly pitfalls, so there's no way to make them any easier. To those fearing the difficulty, the game has quicksave and quickload mapped to the 1 & 2 buttons, so there's really nothing to worry about as long as you remember to save frequently. I've had the PC version of MDK 1 & 2 & the Dreamcast and I have to say the no widescreen support is not that noticeable. 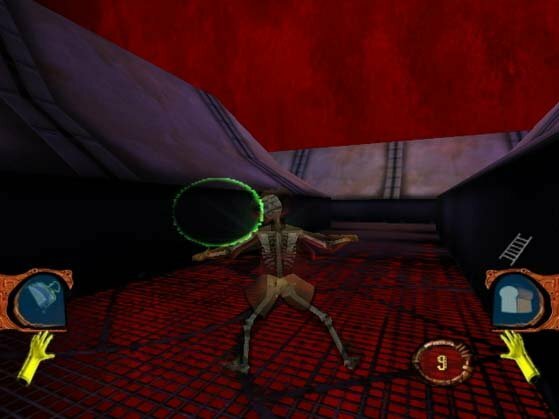 In fact, if you never played the other games you would just think that this is how the game looks. Everything looks good and sharp. I am using component cables with a HDTV if that makes a difference. Great review! I downloaded this game Day 1 and it rocks! Wii controls work very well in this game. This is how MDK 2 should be played. I really, really hope they release MDK 1 on WiiWare. Any word on this? MDK 1 with Wii controls = epic win! If you have not played this game you have to check it out. Another reminder how Wii Controls make PC games play better. At first I thought this was Mario vs. Donkey Kong 2 LOL. Thanks to those who have mentioned the difficulty levels and Quick Save. These features makes the game interesting for me. And it does not look bad. What I saw in YouTube video looks really nice. This could be my next WiiWare purchase. Hope it comes to Europe soon. Finally, another good WiiWare game! Welcome back, WiiWare. I've missed you these last few months.. Anyway, I'll buy this one soon. Will pick it up as soon as it arrives in Euroland. I miss this game! I never thought it would score this high, because I thought it would be hopelessly outdated! Maybe I should try it out someday (when it hits Europe)! I just read on Gamepro that you need 127 blocks for saves (318 for the actual game)! 318 for the game is not that exceptional, but 127 for saves!! That's a lot of space, thus important to point out! A well-deserved score, not to mention what I predicted. In terms of the actual review well-written and informative. Now people will hopefully actually buy this game! @19 If you're going for a list of what can hurt Superman, "Magic" would be a better choice than "Mickey" (or maybe "Masochistic N64 Game"). The lighting in the Wii version is so disappointing. It's insulting to think the Dreamcast version actually has better lighting and shadows than the Wii version. "Unfortunately, Hawkins' stages tend to rely on non-combat scenarios and he proves the most frustrating character to play, feeling like a tedious detour from what makes this game enjoyable.". Dang, That was exactly what turned me off from picking this up back on the Dreamcast (and again on the PS2). Still, it's $10. I'll probably end up preferring the first MDK in the end, since it's more focused (Kurt is easily the only cool part of the game; a weird dog and a goon scientist are not characters to hinge your game upon), but it still looks worth it. Especially since they did the right thing and did pointer/nunchuk controls. That should be rad. @21 the reason the lighting is worse is because they had to squeeze a 250 meg game to 40 megs. Dang... want to play this. but no time. maybe next week. Wii Ware and Netflix have turned this into my most used console ever, even without buying hardly any disc games.. So happy with it. @Ren: I only watch Netflix on the wii, I don't even have cable. And I barely have any disc games. I'm right there with you. @Bulba I wasn't thinking Superman when I wrote doomsday, actually. Funny it worked out that way. Magic it is then. @Zaphod I'm enjoying his levels too, they're very creative and they represent a nice change of pace from the usual run & gun gameplay. I was never dropped on my head though, so the only logical explanation is that everyone else was dropped on their heads instead! Great review NL, I'm currently playing Ys I in Ys I & II Chronicles on PSP so I'm very much enjoying "old-school" gaming right now, will be picking this up soon. currently on level 3 and lovin' it! Checked out a comparison video between WW/DC, and it doesn't look that much different. It looks like most of what was cut was audio resolution and shadows, which doesn't bother me too much and is more than made up for by pointer controls and convenience. It's really impressive they got this game down to 40MB while keeping it a respectable port. You really have to wonder about certain devs pulling their games from WW due to size restrictions after this (though, more space for music would have been welcomed here, certainly). I have this on DC, but maybe now I'll finally beat it! I might download this once / if it hits Europe one day. And here's to hoping that - from the eShop on - file size limitations won't be so strict anymore. I just can't see any justifiable excuse for removing the lighting and shadows. Surely that kind of stuff has absolutely nothing to do with the memory restrictions and more to do with developers who can't be bothered or don't care about implementing these graphical techniques on Wii games. If it can be done on a game like Rage of the Gladiator it could have been done here too. I'm sick and tired of Wii games, both disc and WiiWare, looking far below par for this generation of home console games, and that's even taking the Wii's relative power into account. Go back a generation, maybe even two, and shadows were generally done far better than they are in most Wii games. It's like we've actually went backwards with certain graphics technologies and visual effects on Wii (what is it with having either circles for shadows or no shadows at all in most Wii games). @Zaphod: At least you still have your other head. @Kirk They removed the shadows so that the game could run at a constant 60 frames per second, according to an interview with Nintendo World Report. It was definitely the right decision, as fast-paced games which require twitch aiming really suffer when running at lower framerates. Rage of the Gladiator looks ugly and choppy running at 30 fps and would've been a much better game if they toned down some of the effects to get it to run at 60. Now granted, it shouldn't have been impossible for Beamdog to implement shadows while still having the game run at 60, but given that it was their first time working with the Wii hardware I'm willing to give them a pass. I think I'll just pick up the PS2 version. Probably cheaper too, though I haven't checked yet. Is Rage of the Gladiator even close to the same thing as MDK2? No... From what I understand from the demo, you stand there and fight things that are in front of you. That sounds nothing like MDK2, MDK2 has worlds to explore, puzzles to solve and guns to shoot. I think these games shouldn't be compared. Beware that I and at least one other player have experienced freezes with this game that locked up our Wiis. It seems unlikely, but I would like to see Arx Fatalis on Wii Ware. You guys do know that you could look up the Dreamcast version on GameFAQs to find out how to get past tricky parts of the Doc's levels, right? @BulbasaurusRex: It's not a matter of now knowing what to do, it's that actually doing it can be a huge pain. Tried this game and its really good except when you die you start at the beginning of the level. No Checkpoints? Despite being a fair review, it feels like the reviewer focuses too much on the game being "too hard", which as I stated with EWJ2, isn't really true. This game isn't that hard. I wouldn't let the difficulty complaints deter you unless you just aren't cut out for action-platforming games.